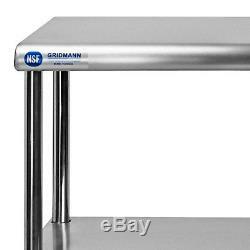 Heavy-duty - Constructed from 18-gauge #430 stainless steel, and is an ideal double overshelf for use in any kitchen, bar, restaurant, laundry, janitorial room, cafeteria, garage, or other commercial setting. NSF certified - Meets strict standards for public health protection. High-quality - Built for high-volume use to last a lifetime. 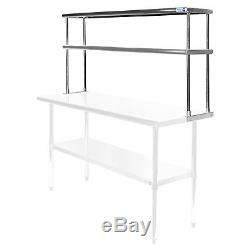 Versatile - Adjustable height middle shelf. Overall size: 60" long, 12" deep, 31-1/4 tall. Safe - Rounded edges and corners for easy cleaning and superior working comfort. 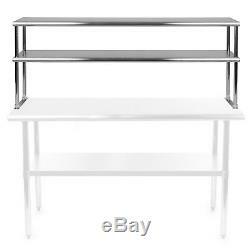 Sturdy - Shelf is designed to be attached to a 60 table via the table edge mount's pre- drilled holes. Quick set up - Fast and easy assembly. This product is designed and finished for use in a commercial environment. Therefore surface imperfections such as scratches, scuffs and indents may be found. This is normal and to be expected on products of this nature. Double overshelf with edge mount. 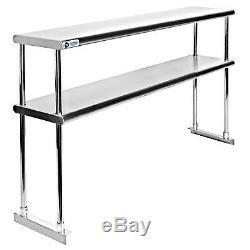 The item "Commercial Stainless Steel Kitchen Prep Table Wide Double Overshelf 30 x 60" is in sale since Thursday, December 15, 2016. 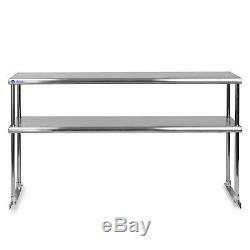 This item is in the category "Business & Industrial\Restaurant & Food Service\Commercial Kitchen Equipment\Storage & Handling Equipment\Shelving & Racks". The seller is "leadingliving" and is located in Fort Lauderdale, FL. This item can be shipped to United States.